Local students gather at Mt. Zion Church for one of the many Mosby Heritage Area Association programs held throughout the region each year. Top: Willowcroft Winery, one of Loudoun County's first vineyards. The Mosby Heritage Area is an educational, scenic, cultural, aesthetic, and economic resource raising the quality of both residents' and visitors' lives, providing a sense of place for you, your family, and those who visit you. Riders cross the Catoctin Aqueduct on our C&O Canal in the Civil War bike tour. 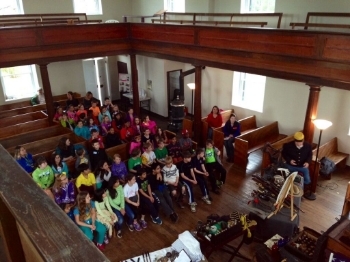 We implement a variety of school programs that bring our heritage alive and teach students the importance of preserving our heritage resources. We reach 3,000-5,000 students each year with in-person classroom and field trip presentations. We sustain a corps of volunteer interpreters—the Mosby Heritage Area Interpretive Group—to provide high-interest public interpretive programs and build our organization's historical expertise. We create interpretive programs such as Legends by Lanternlight that regularly bring heritage area history alive with lantern-lit costumed interpretation at local historic sites while passionately encouraging participants to become heritage stewards. We sponsor a variety of lectures and tours focusing on aspects of the region's sense of place. We present a three-day Civil War Conference that details Civil War history in our region and fosters stewardship of area battlefields. Dave Goetz gives a talk as Major Adolphus E. Richards circa 1899. We publish the report Profiting From Preservation that makes the economic case for preserving open space, renovating and restoring historic properties, and promoting and enhancing agricultural enterprises, including its vineyards and wineries (above, vineyard at Willowcroft Winery, Loudoun County). Addessing key issues in the media from time to time. Attending and speaking at public meetings where the fate of resources is at risk. Holding a preservation forum that allows those experienced with preservation issues to offer insights and advice to individuals just beginning to get involved. Mosby Heritage Area Historian Emeritus Rich Gillespie speaks at the Prince William End of the War Symposium. Implementing an American Battlefield Protection Program grant to save the cavalry battlefields of Aldie, Middleburg, and Upperville. If you would like to read the Draft Preservation Plan for the Aldie-Middleburg-Upperville cavalry battlefields, please contact the Mosby Heritage Area Association. Inventorying key historic sites in conjunction with the Land Trust of Virginia to promote use of conservation and preservation easement tools available from the Commonwealth of Virginia. We reach new and longtime residents, families, teachers, and students, encouraging them to learn about and explore the Heritage Area through our driving tours, scavenger hunts, interactive tours, maps of the historic region. Be sure to visit the See It section of this website for these activities. We give public presentations to civic, business, and school groups about the Heritage Area and its value, including increased tourism and revenue to the business community and counties. The benefits of preservation to the community at large is documented in our study Profiting From Preservation. It includes relevant information on federal tax credit programs, federal enhancement projects, dividends from heritage tourism, the taxpayer-borne cost of development versus open space, and profits from the equine industry and agricultural economy, including wineries and vineyards.